Total losses of the Syrian Air Forces in battles above Lebanon (period from 7 to 11 June 1982) have made: 6 MiG-23MF, 4 MiG-23MS, 14 MiG-23BN, 11 MiG-21MF, 26 MiG-21bis, 7 Su-22m. 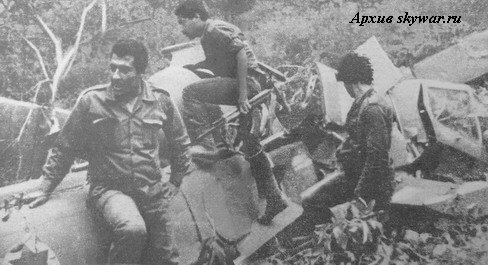 27 pilots was killed and 18 wounded. Two more MiG-23BN was downed in june, 24 1982. Also Israel claimed one recce MiG-25 on august, 31 1982, but Syria AF had no operational aircrafts of this type in that time. First MiG-25RBS was airworthy only in end 1982. Israel have confirmed only damage of one F-15D in air-to-air combat 9-jun-82, pilot Shapiro managed to land on air base in Ramat-David. Most likely, this victory has gained the 25 years old MiG-21bis pilot Capt. Nafiya Sel'mu from a squadron of Lt.Col. Moris Georgeus. Result on HUD-camera.